Whether you love the giant-scale version or want a Hangar 9® classic on the lighter side, your next dream machine has arrived. The new Hangar 9 Valiant™ 10cc airplane is everything that made the larger version famous in a size engineered to take full advantage of smaller engines. It will also accept brushless electric power systems too—no modifications necessary. With a 10cc gas engine such as the easy-to-use Evolution® 10GX, you can expect to get long flights with a small 7.5-ounce tank that costs pennies to fill. The large front hatch makes access from the top convenient and electric flight battery changes simple. Count on the laser-cut, lightweight balsa/ply construction to stand the test of time while the genuine UltraCote® covering makes its classic lines shine through. The two-piece, cantilever wing design eliminates the need for wing struts and gives way to a stylish look that makes field setup simple. You won't be laboring over the basic build for long either. Except for the glue-in horizontal stab, vertical fin, and control surfaces, a majority of assembly is bolt-together. All hinge slots and holes, including those for the flaps, are factory made so that your time at the bench can be more enjoyable. The wheel pant accessorized undercarriage completes the sleek appearance with the rugged ability to operate from average grass runways. Also on the underside are factory installed hard points so that the optional lightweight float set can mount-up with the turn of a few screws. The Valiant design has proven versatility and virtuous flying manners. 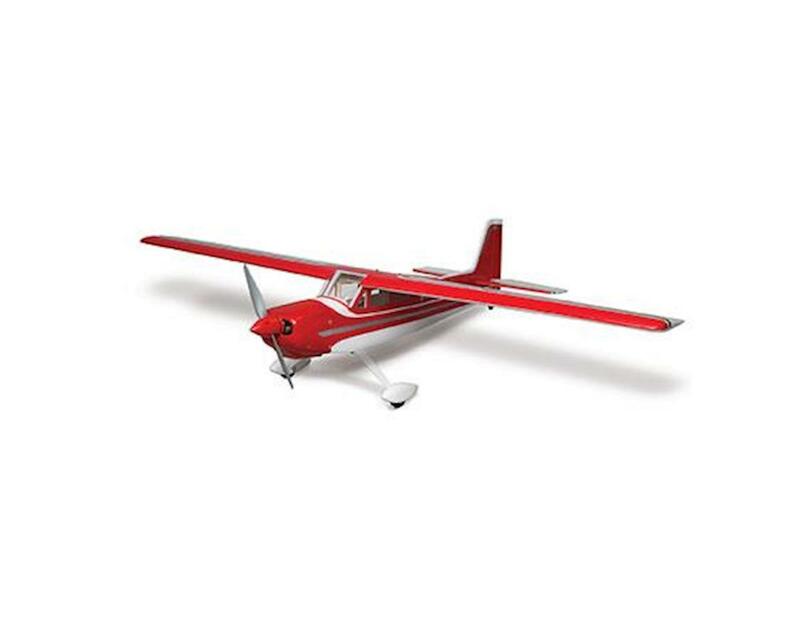 A semi-symmetrical airfoil provides outstanding stability and good wind penetration so you can be comfortable flying even when the air currents are less than ideal. Operational flaps can make takeoff and landing super-short, while a touch of flap makes cruising around at slow speeds more than a pleasure. Flaps up, the Valiant airplane is a sport aerobatics dream machine with dramatic loop capability from any attitude, crisp roll performance and enough rudder authority to do impressive knife edge passes—especially for a high-wing cabin model. Like its big brother, the Valiant 10cc presents with an overall rock-solid feel in the air, like a giant-scale model. As the namesake implies, the Valiant 10cc is sure to become a hero around your club field as the model to have, no matter what flying occasion may rise. Laser-cut, lightweight balsa and plywood construction is utilized to bring the Valiant 10cc to life as a durable sport model that's expertly built to exacting standards. Genuine Hangar 9® UltraCote® covering provides an easy-to-maintain finish that looks great. The light wing loading and semi-symmetrical airfoil combine with an abundant power source to offer exceptionally friendly flight performance. Operational flaps allow its versatile flight envelope to open even wider into the world of Short Takeoff and Landing (STOL) capability. The optional Carbon-Z® float set and wire mounting strut set exactly fit into the factory installed hard points located in the belly of the Valiant 10cc airplane. Once assembled, conversion to a float plane takes only minutes to complete. The Valiant 10cc is designed to accept the Evolution® 10GX, 10cc gas engine, an 11cc four-stroke or brushless electric power plant equivalents. Hardware for both options is included along with an electric motor mount so you can get in the air faster.